Need a new boiler in Twickenham? Get FREE no-obligation quotes now! 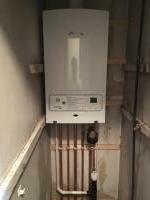 Thames Heating Services Ltd are Gas Safe registered heating engineers who supply and install gas boilers. For similar replacement boiler companies in this area please visit the Twickenham boiler page. Welcome to Thames Heating Services. We are a professional accredited company, dedicated to giving our customers the best possible service and expertise. Offering over 11 years of industry experience in central heating and plumbing. The foundations of the company are built on honesty, trust and reliability. We value our customers and pride ourselves on client satisfaction and customer service. Based in Twickenham we offer an excellent team with a wealth of experience to provide a high quality service to all local and surrounding areas at a competitive and affordable price.